It was an up and down week at the Mecum Auction in Glendale, Arizona, outside Phoenix. The weather and the emotions were a bit of a rollercoaster. When the Dodge team got there to prepare for our Dodge Thrill Rides, it was raining and in the 50s … hardly desert weather. The following day, there was 45 mile per hour winds that had everyone hanging on to their hats (and anything else that could blow away!). But as Mother Nature calmed down and warmed up, the excitement grew around Mecum’s first-ever show in Phoenix. We were excited to showcase our revised Dodge Thrill Rides program, with new cars, a new track and a push for our hashtag: #DodgeThrillRides. Follow that to watch videos and see photos from our guests. The auction was originally scheduled to be a two-day event. Then it grew to three days. But that wasn’t enough: With over 1,100 cars and 100 motorcycles, the show expanded again to include a fourth day. Crowds were strong and the State Farm Stadium, home of the Phoenix Cardinals, was a great host for the sale. Some of our favorites of the event included this trio of 1970 Dodge Challengers. Interesting to see how the “same” car can get such different money (please note the quotes around the word “same” … they’re definitely NOT!). An absolutely stunning automobile that’s perfect in every way: HEMI, Plum Crazy, 4-speed, drop top. It’s all there and the crowd opened their wallets to own it; this one sold for over $1.4M! This car is amazing in its own right. If not for the Plum Crazy that sold for 14 times as much, this could easily have been the star of the show. Sublime green paint. Elephant under the hood. 727 trans. Hood pins. Outstanding machine that proves pretty much anything with a HEMI engine is a six-figure car. This is a real-deal T/A, complete with matching numbers 340 Six Pack and a pistol grip 4-speed transmission. Go Mango paint and those classic side dump exhausts give this car the look of the racetrack machine it was based on. Note: The factory hood is fiberglass and that bulge you see along the edge of the cut line happens to essentially all T/A cars. It’s not considered a defect, rather a reflection of authenticity. The other big story of the weekend was a number of old NASCAR cars that were described to have been raced by the late Dale Earnhardt Sr. Rumors popped up that they may not be what the seller claimed them to be: For example, one of them was a 1994 model, chassis #9309, that is reported to have been the actual car Earnhardt drove to clinch his seventh NASCAR title. However, Richard Childress, Earnhardt’s team owner, claimed just last Friday that he has that winning car in his museum in North Carolina. That car was bid up to $190,000 but didn’t meet its reserve. 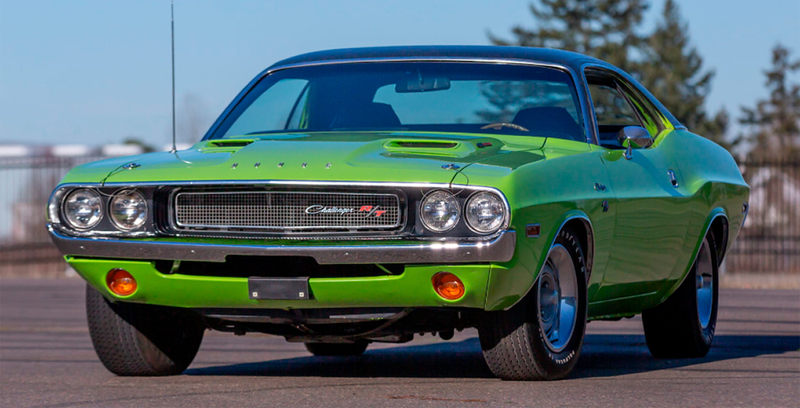 The next Mecum auction is in Houston, April 4-6. You’ll get your chance to bid on over 1,000 cars and join Dodge as we continue our season of shredding tires with the Dodge Thrill Ride show. Come see us there!